In honor of Zola's birthday, I was happy to sign up for a Zola reading event hoted by Delaisse and Fanda. 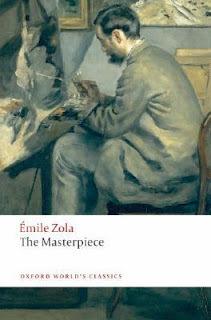 I had six novels by Zola on the TBR shelves, and I settled on The Masterpiece because I'm fascinated by Impressionist painters. (And because it's fairly short, less than 400 pages.) Though it's not my favorite Zola so far, it was definitely interesting, though tragic. The Masterpiece is the fourteenth book in Zola's Rougon-Macquart cycle, and it's the story of Claude Lantier, an Impressionist artist living in Paris and his obsession with creating a masterpiece. Claude's obsession becomes his downfall. 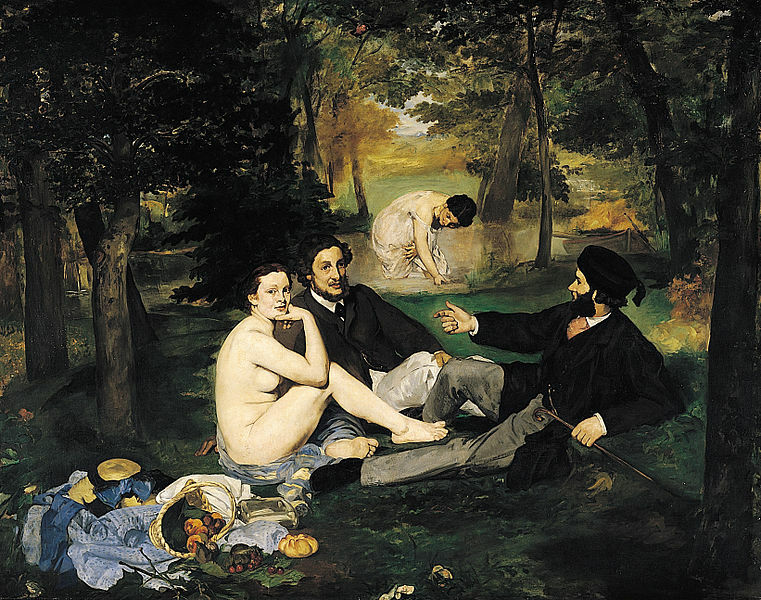 The character of Claude is based on the Impressionist Paul Cezanne, Zola's childhood friend. Not actually a painting by Cezanne -- this cover is a detail of a portrait of the artist Bazille, by Auguste Renoir. ﻿﻿﻿ The story begins in Paris in the 1870s, on a stormy night. Claude Lantier, an artist, returns to his studio/apartment and discovers a young woman waiting in the vestibule. She claims to have been abandoned at the station after her train was delayed. Claude is mildly suspicious but insists she come upstairs and stay the night. Though she's nervous, it's all very chaste -- Claude sleeps on the sofa and gives her the bed. In the morning, he peeks at the sleeping woman, Christine, and is so inspired by her beauty that he begins to sketch her. After she awakes, she flees the apartment, but returns weeks later to thank him. They begin a friendship that eventually blossoms into something more. That's when the torture begins; you've drunk your excitement to the dregs and found it all too short and even rather bitter, and you wonder whether it was really worth the struggle. From that point there is no more unknown to explore, no new sensations to experience. Pride has had its brief moment of celebrity; you know that your best has been given and you're surprised it hasn't brought a keener sense of satisfaction. From that moment the horizon starts to empty of all the hopes that once attracted you towards it. There's nothing to look forward to but death. After The Masterpiece was published, Cezanne never forgave Zola and refused to speak to him ever again, so it must have hit pretty close to home. I liked this book, though not as much as some of the other Rougon-Macquart novels I've read. I found the plot to be a little on the slow side. Zola's characters tend to be fairly awful people, but the stories themselves are so compelling I can hardly put them down -- I zoomed through Germinal and La Bete Humaine in a just a couple of days each. This one took longer. I did like some of the characters, especially Sandoz, and the story was interesting, but somehow it didn't hook me the same as some of his other novels. However, I'm still going to keep going with Zola. Eventually, I hope to read the entire series, though I doubt I'll ever read them in order. And some of them are still only available in the Vizetelly translations which are terribly bowdlerized. I'm toying with the idea of taking up French so that I can read them in the original, though that's probably a drastic solution. Has anyone else read The Masterpiece? What did you think? Any other favorites by Zola? I'd like to read another before the end of April, and I'm thinking of The Ladies' Paradise. Thoughts? One of the best things about Anthony Trollope is that he wrote 47 novels. It's also one of worst things about Trollope, because now I want to read all of them, which could seriously take me the rest of my life. Anyway, I'm in an online group that wanted to read one of his novels, which is always great, but the book they selected was The American Senator. Sadly, it's not one of the many Trollope novels languishing on my bookshelves. If you've heard of The American Senator, you're probably a pretty hard-core Victorian lit lover (actually, if you've even heard of Trollope you're probably a hard-core Victorian lover!!) Compared to Dickens or even Thomas Hardy, Trollope's books are barely a blip on the radar. And that's a real shame, because they are just wonderful. I loved this book. The name of this book is really misleading, because the senator himself is actually a minor character. This is the story of two cousins, John and Reginald Morton, and like many Trollope novels, it's full of love triangles, class conflict, and some jabs at the British aristocracy. It's set against the backdrop of English country life, particularly the fox hunting season. John Morton, the heir, has been living abroad in America while working in the British foreign office, and returned to his estate, Bragton, with a party that includes his grandmother; his fiancee, Arabella Trefoil; her mother; Lady Augusta, and a visiting American Senator, Elias Gotobed. John Morton is estranged from his second cousin Reginald, since Reginald's father married below his class to the daughter of a Canadian shopkeeper (gasp!) John's grandmother would not receive Reginald's mother, and was furious when Reginald inherited a small part of the estate. Reginald is close to his aunt, Lady Ushant. Years before, Lady Ushant had taken in a companion, young Mary Masters, daughter of the Morton's solicitor, Mr. Masters, a widower. Masters eventually remarried, and now Mary is back living with her father, stepmother, and half sisters, and is being courted by a local landowner, Larry Twentyman. Mrs. Masters is eager to settle Mary with Mr. Twentyman, though Mary is hesitating, because she's secretly in love with Reginald, whom she's known her entire life. As a Jane Austen devotee, I could see parallels between their relationship and Emma and Mr. Knightley. Mary's stepmother also reminded me an awful lot of Mrs. Bennet from Pride and Prejudice, though Mr. Masters is a much better father than Mr. Bennet. Meanwhile, Arabella is jockeying for position between her suitors, and her strategy would make any politician proud. As I was writing this, it occurred to me that the fox hunt is sort of a metaphor for Arabella's search for a rich husband. She'll have to make bold moves to win the big prize, but if she's not careful, she could get left behind or thrown from a horse. The book actually reminded me a lot of the first season of Downton Abbey, when Lady Mary is trying to make the best possible match since she can't imagine marrying her cousin Matthew, heir to Downton -- especially the episode where they go fox hunting and she meets the ill-fated Mr. Pamuk. (If you haven't seen it, go out and watch it right now. Seriously!) The American Senator is set about forty years before Downton Abbey, but some of the themes are really familiar. This story starts out slowly, giving background about the village and the county, and the complicated history of the Morton cousins, to which I had to refer several times since I couldn't get into the book at first and sort of lost the thread of all the characters and their relationships. But once I got going I was hooked and could hardly put it down. The plot really takes off and I think I read most of it in about three days, which is pretty fast for a Victorian triple-decker. It's one of Trollope's comic novels and Arabella is a fascinating character, probably one of Trollope's most distinctive females. She makes no pretense about her social climbing, and she and her mother are just an awful pair. And they're funny. The way they snipe at each other is pretty hilarious. 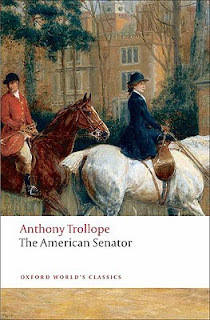 I really enjoyed this book, but it's not my very favorite Trollope because I did find the beginning rather slow to get into, and also, I didn't really like the actual American Senator character. Trollope uses him to get up on a soapbox and has the character spout off about some the appointments of the clergy, the British Parliament, and also about some of the stuff that the members of the aristocracy get away with. I understand he wanted to make social commentary but sometimes it just felt awkward and forced, not very organic to the plot. Despite these minor flaws I just loved it and now I want to put everything else aside and just read more Trollope. 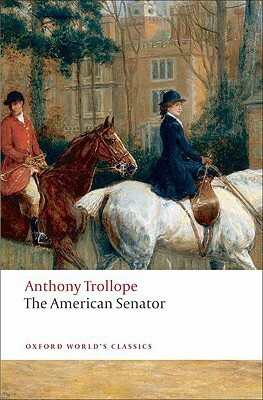 Anyone else out there reading Trollope? Which is your favorite? Besides this one, I've read The Barchester Chronicles and The Way We Live Now. Which one should I read next?